Bungee jumping off a ramp : a revolution ! Come test this new concept which enables you to jump from a 50 meters high springboard over the empty space. Great sensations guaranteed : alone, tandem, bike, sledge, almost everything is possible. Situated only 30 min away from Annecy! Come and jump ! 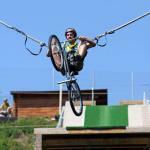 Come and try bungee jumping with a bike or a sled, on a 40m high jump ! This experience will give you unique sensations. Ideal for thrill seekers ! Too afraid to jump on your own? Jump with a friend ! 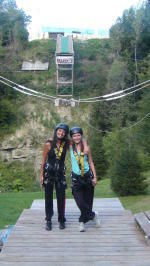 With the Tandem Bungee jumping a maximum of two persons can jump together ! A sled will bring you two into the 40m high emptiness ! Adrenaline rush guaranteed !